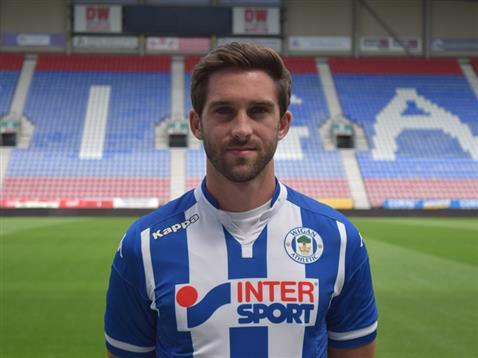 Will Grigg grabbed a brace for Latics. Photo courtesy of Wigan Athletic. Wigan blitzed Colchester with a five-star show at the DW Stadium on Saturday afternoon. Latics tore into the U’s from the kick off and were ahead after only five minutes through Donervon Daniels after good work by Yanic Wildschut, and they went on to score three more before half time as the away team were left chasing shadows. Max Power’s deflected shot, Daniels right footed drive and Will Grigg’s smart finish reflecting Wigan’s total dominance. They should have scored more in a second half they fully controlled, but they did add a fifth following a sublime chip by Grigg in the 87th minute. This emphatic display demonstrated the wealth of talent now available to Gary Caldwell and if this level of performance can be maintained, then Latics will soon be challenging for one of the top spots in League One. Gary Caldwell made one change from the team which drew at Bury with Will Grigg returning from international duty replacing Jordy Hiwula. Latics attacked from the kick off with Yanic Wildschut the outstanding player. The Dutch winger was unstoppable as he tore down left hand flank. Wildschut created Latics’ first goal after only five minutes when his cross from the left was met by Daniels who finished from close range. Latics almost doubled their lead three minutes later when Wildschut broke clear but couldn’t quite manage to get the final touch past the advancing Jamie Jones in the Colchester goal. But in the 11th minute Latics went further ahead when Max Power unleashed a shot from 25 yards and the ball deflected off a U’s defender before looping over the helpless Jones and into the net. The onslaught continued and Latics went further ahead on 14 minutes. Daniels was again on target when he picked Grigg’s header and he comfortably side footed the ball into the bottom right hand corner. Colchester were shell-shocked as Latics attacked in numbers with Wildschut, Jacobs, and Grigg all outstanding and the central midfield pairing of David Perkins and Power tenacious and combative. It was not long before Latics made it four. Following a slick passing move the ball came to Perkins who drove forward into the area before pulling the ball back to Grigg, and the striker showed great composure to slot the ball home. Wigan could have gone further ahead before half time when Grigg fired across the six yard box but no attacking player was able to make the vital contact. The home team went into the interval with a four goal lead, but it could so easily have been six or seven, such was their dominance. Wildschut continued to torment the Colchester defenders in the second half and he nearly got on the score sheet five minutes into the second half, but his shot from close range was well saved by Jones. After 60 minutes Gary Caldwell decided to give the impressive Wildschut a rest and the winger left the pitch to a standing ovation. Grant Holt was introduced and Francisco Junior also replaced Michael Jacobs. Holt was soon in the thick of the action and he had a couple of opportunities to get on the score sheet, firstly when Junior played the ball to Grigg in the area and the striker pulled it back across, but Holt couldn’t quite make the vital contact. His second chance came when he was clean through on goal and although his shot beat Jones it also disappointingly went past the far post. Latics finally got their fifth goal on 87 minutes when Grigg produced a sublime piece of skill to chip Jones. The striker was released by substitute Donald Love, and he produced a delicate chip to lift the ball over the advancing Colchester keeper to round off a totally dominant Latics performance. This entry was posted in Colchester United, Donervon Daniels, League One, Max Power, Wigan Athletic, Will Grigg and tagged Colchester United, Donervon Daniels, League One, Max Power, Wigan Athletic, Will Grigg. Bookmark the permalink.